At an astrophoto session with Ludo and Fred form the astronomy club, we found ourselves in trying to kill the time by talking about other things while the camera was doing exposures all alone on the foyer of our instruments. That’s when Ludo says it would be nice to have a Dobson to visual observations during this time. The idea of building was in my head for a lot of years. 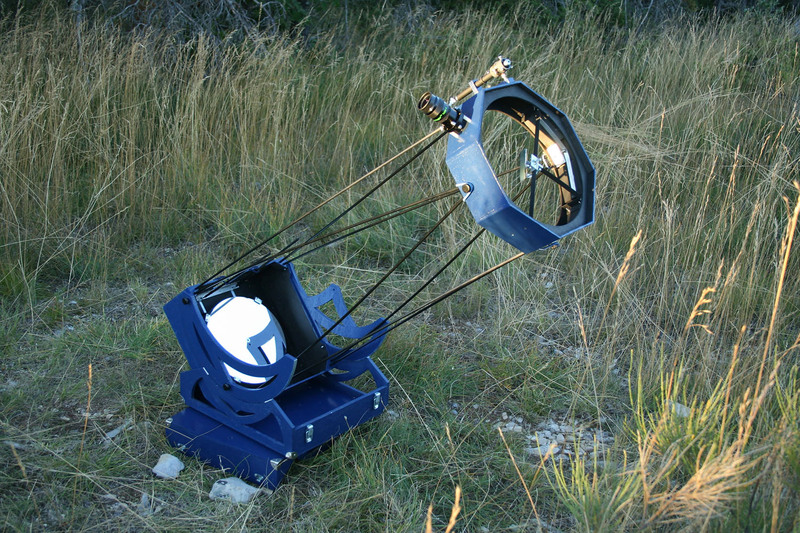 In late 2006, in the astronomy club, I met someone who had to engage in the construction of a “foldable” Dobson. His project included the size of the mirror. 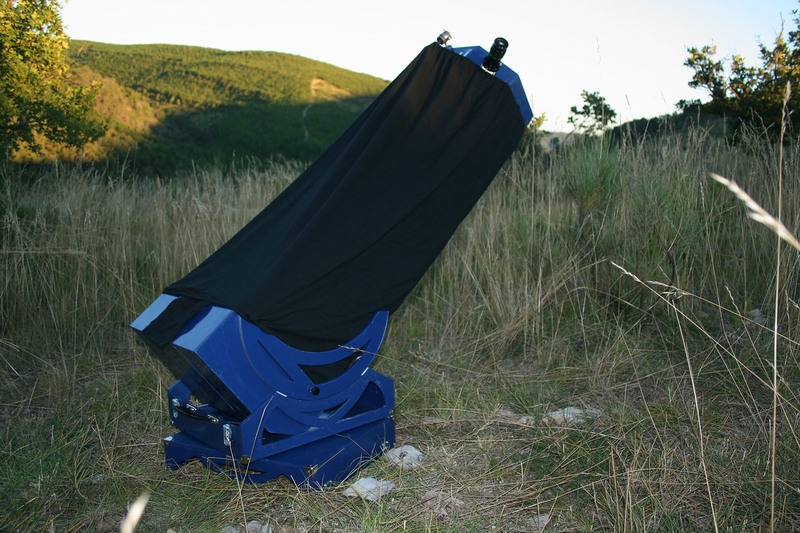 I consulted various website about amater telescope making, mirrors suppliers, etc. 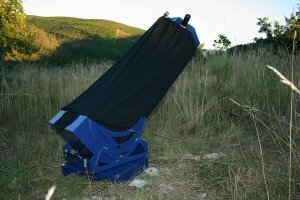 The concept of “foldable” telescope, a 250 that fits in a suitcase – amazing, huh! – Took me quite naturally on the site of Pierre Strock and the club Magnitude 78. Living in an apartment, I could net see myself machining wood in the middle of my kitchen ! Initially I had the idea to do this on my balcony in the summer but for this I needed a set but I had no place to store it. 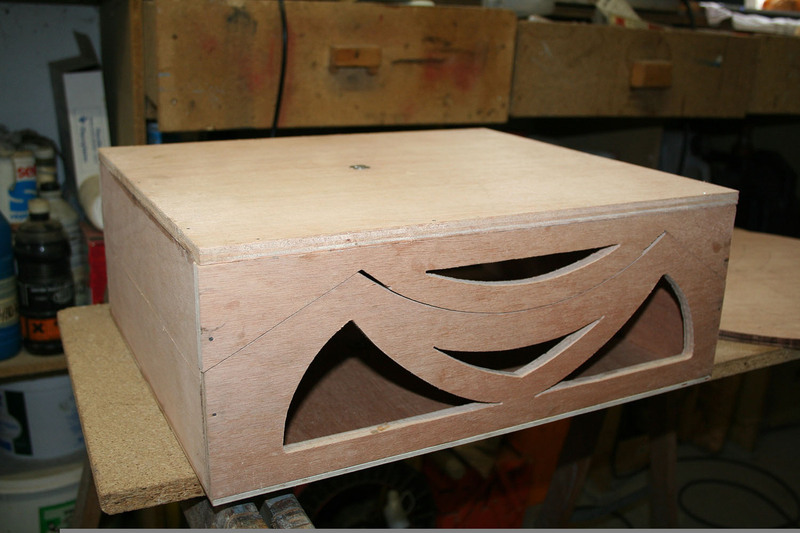 The month of May arrived, I had a few vacation days to take, then I thought to myself that I could spend one or two weeks holiday in the workshop of my father who has all the tools needed and a lot of little stuff whose usefulness will become clear once we are in the bath. I spent the weekend of May 1st at my parents house and I decided. 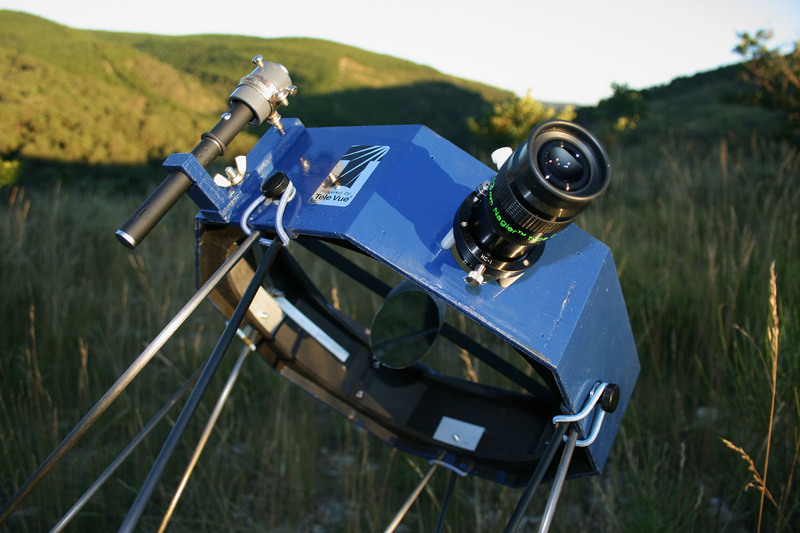 On 30th April 2007 I placed an order for the optical at Teleskope-Service : a primary mirror of 250mm diameter and 1250mm focal length and a 50mm secondary mirror. 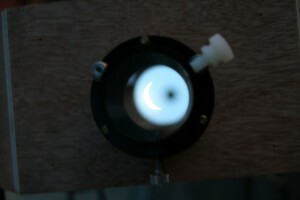 I also order the focuser at Kineoptics : a light helical Crayford, ideal for Strock. I schedule my vacation : Thursday 17th May is a public holiday, I take Friday 18th and the following week which gives me ten days to do the maximum. I naively thought I could to about 90% in ten days so it only remains a few details to complete at home after the holidays. During the two weeks preceding the holidays I made several stores in the Grenoble area in order to have all materials for the construction during the holidays: two 120x60cm plywood plates 10mm and 5mm thickness, screws, Teflon pad (pad to drag the furniture), carbon rods for kite for the truss structure found in Decathlon, etc.. and a small drill presses. Friday May 4 : receipt of optics. 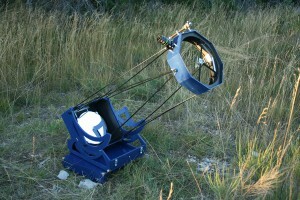 Primary parabolic mirror 250/1250mm in BK7. Thickness 35mm. It weighs 4kg. Strock designers recommend a mirror between 2 and 3kg for the instrument to be balanced, it will therefore be necessary that I put a counterweight. It’s not so much in the spirit of Strock but so be it ;-). Teleskope-Service guarantee a surface quality of lambda/16 RMS or lambda/4 PTV. This is certainly not extraordinary but it is not worse than the optics of a Dobson frome the shops. Thursday May 17th, I put all the gear in my car and I go to les Vosges. The focuser is missing, I shall be delivered at the office but it is not arrived yet. Start of the construction Friday 18th May. 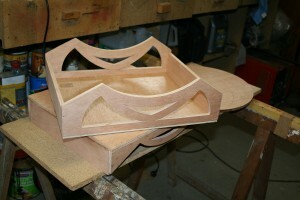 Sunday 20th May : The Primary case is done. I began to realize the time it might take. The case serves as a base for the movement in azimuth. In the background, we can see the disk on which the axes are drawn and ready to be cut. Friday 25th May : The primary case is well advanced. 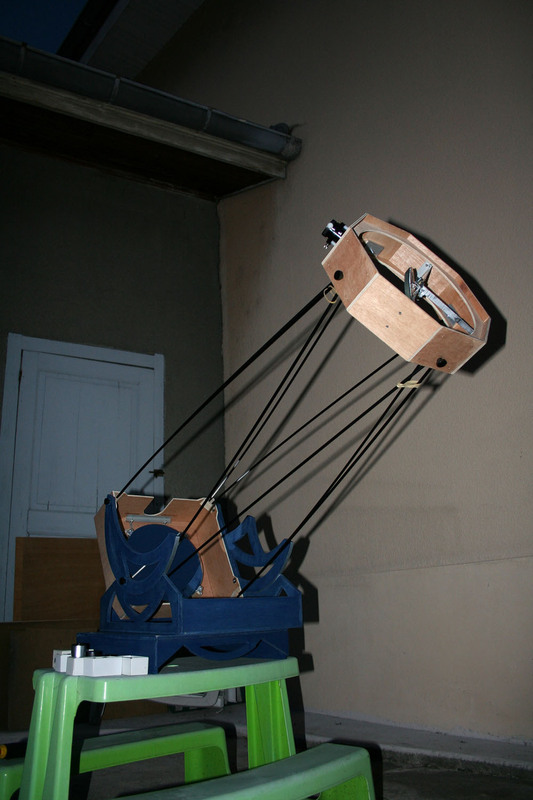 The two movements of the telescope are functional. 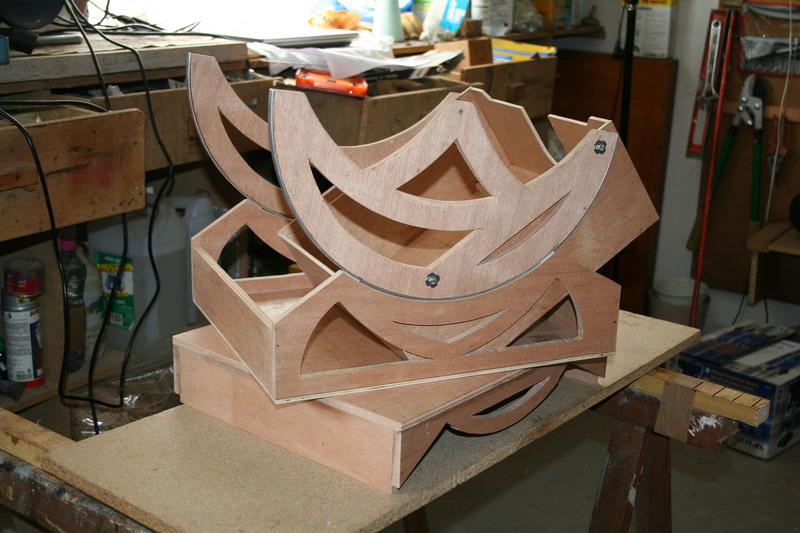 The support for the primary mirror, the mirror cells, is taking shape too. The characteristics of my mirror are not the same as the one recommended on Strock website. I calculated my own 9 points mirror cells with the software. Saturday 26th May, assembly of the secondary cage. 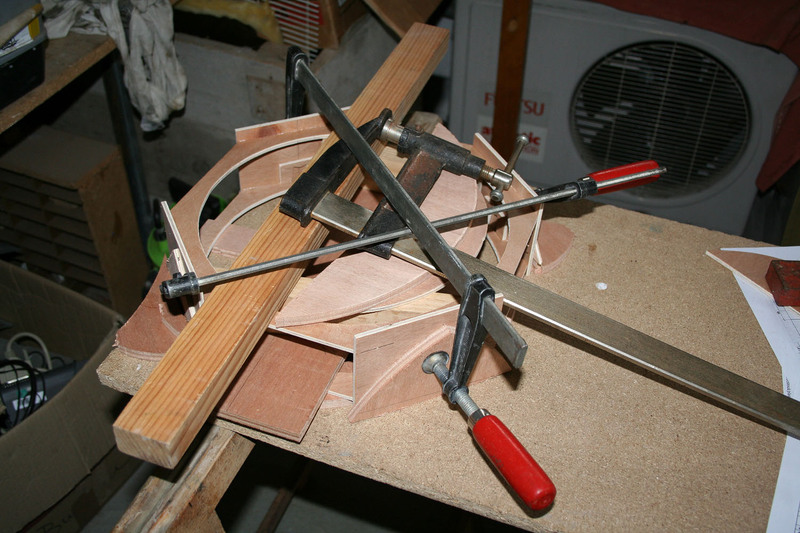 Wedges and clamps. Sunday moring, 27th May, I finished the assembly of the secondary cage. Holidays are over, I set up the beast in the garage to get the work done. Do not take care to the length of the truss structure : I did not cut the carbon rods. They are more than 60 cm too long ! 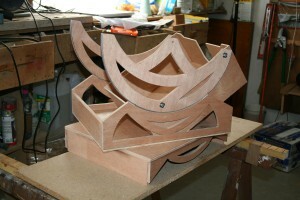 It was ten days of intensive work and somewhat stressful since I realized that it took more time than I thought. Finally the biggest is done and I’ll be able to complete the project in my apartment. Monday 28th May, back to the office, my focuser was waiting for me on my desk for a week. Installation on the secondary cage that evening. It is a 1.25” (31,75mm) helical Crayford Kineoptics HC-1. We focus by turning the eyepiece. The movement and very soft. It weighs 62g. The project continues slower. 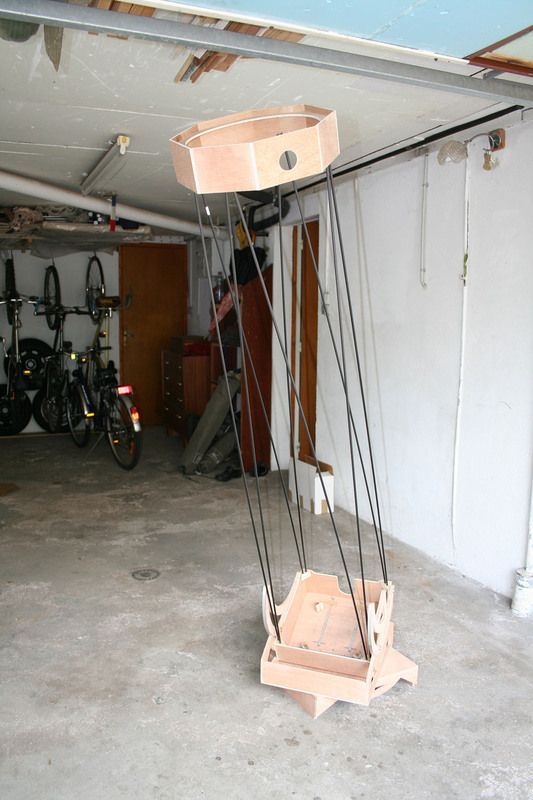 I spent some evenings and weekends to make the secondary mirror support and the spider. Saturday 9th june, first layer of paint. I did this in my apartment, properly ventilating of course. 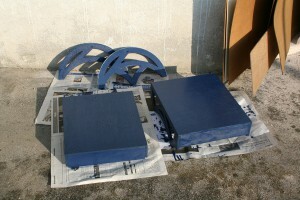 I took advantage of good weather to dry the pieces on the balcony. 28th june, it don’t miss a lot of things : a few layers of paint and other small details. I cut the carbon rods to one meter and go down on the balcony to make the first functional tests. I set up the instrument on the table of the neighbor children and I point the moon. Result : the rods are too long. We still can see the image of the moon on the focal plane. I can not resist to take some pictures by hands. I gradually cuts my rods. After several tries I get the length of 973mm. 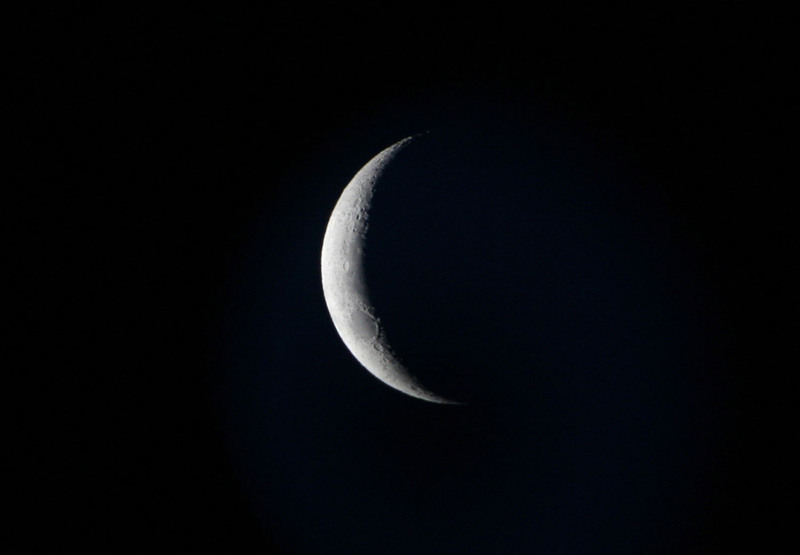 Friday 6th July, the first light is for tonight. I go to our usual observation site at Beaucroissant once arrived, I realize that the grass is too high for a Dobsonian such as a Strock. I go to Quincieu and Col Lachard. I set up at Champs Floux one kilometer east of the col. There is some wind, as always at col Lachard, but it’s not a probleme with a truss telescope. 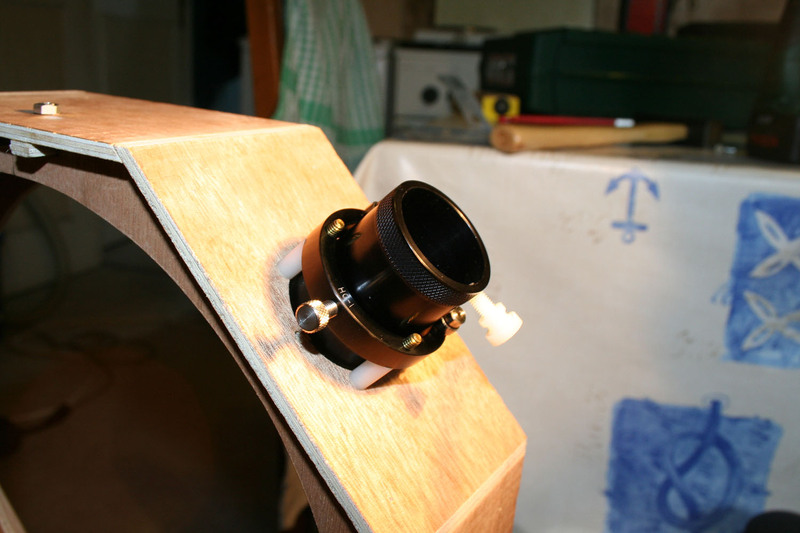 First difficulty: to do the collimation in the dark as I usually do it at daytime with a collimation eyepiece. I fight for a few minute while a I illuminate the primary mirror and I finally get succeed. The choice of the first object is important : it is the one which will give me the first emotion with this new instrument. I point M13, again, as I can, because I have no finder and no support for the green laser. 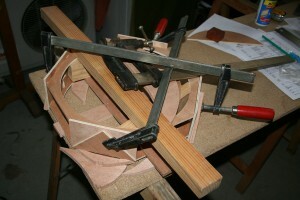 I realize a big problem : the primary case stick in the rocker. I replace the plywood 8mm by 10mm without taking into account the internal dimension of the elements of the telescope. It did not seem uncomfortable during construction but with the painting it became really problematic. All this does not prevent me from finding M13. From 200mm diameter globular clusters seen visually begin to resemble photographs. All the stars are resolved until the center of the cluster. I point the whirlpool galaxy (M51). She is brilliant. We don’t see the spiral arms but we recognized very well its shape. The moon rises and I finally repack. I have observed only two objects but I had a good overview of the potential of the instrument. I still have many things to improve. On 10th July I order two Televue Nagler eyepieces at Oceanside Photo and Telescope : a 13mm and a 9mm. I sand the inside edge of the rocker with the Dremel in one hand and the vaccum cleaner in the other for not having too much dust in the apartment. During the summer holidays I spent a few days at my parents house. I make a support for the green laser pointer bought at Hong Kong by ebay. It should serve as finder with its visible beam at night. With binocular, it is particularly effective. I cut an 8mm thick sheet of iron that I fix in the cage secondary as counterweight. Il ya 250g de contre-poid. 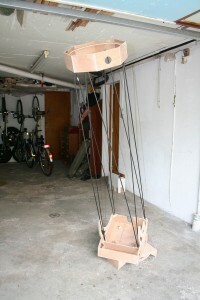 There is 250g of counterweight. I asked a sock to my mother, former couturier. She brought me a black cloth. 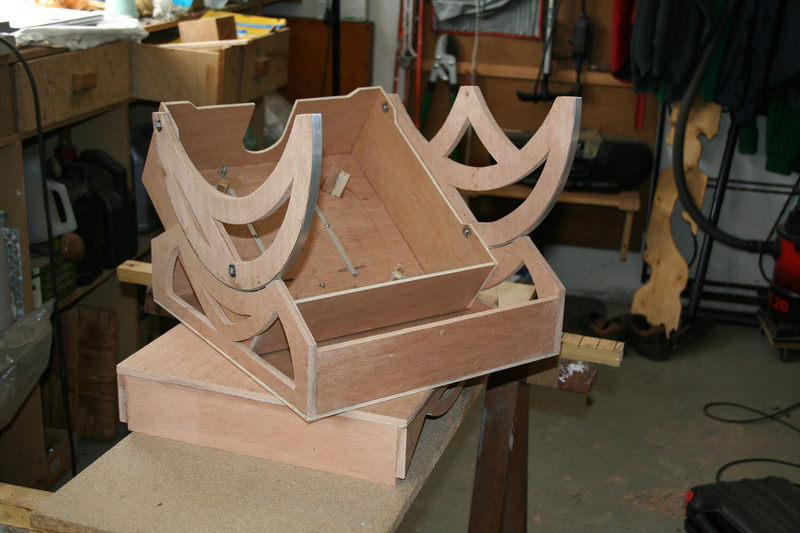 We adjust the piece together on the trus structure and she sew two rubber bands on each side. The remaining cloth is used to make a case for the carbon rods, very useful. Thank you Mom ! Saturday 11th august, go to L’Epine with club members. The movement in altitude is no longer a problem. The Strock is fully operational. I do not know how many objects I saw, I am delighted. Is the fulfillment of the project, I have measured and appreciated the work done. The next ? A 400 ou 500 (almost 20”) F/4, It is great to have dreams. I know when you love, it does not matter. But I wanted to get an idea of the price compared to the instruments from the shops. The most important is, of course, mirrors. It is also the most variable because you have mirrors from 300 euros to the top of the range made by an artisan around 1500 euros. Differences in quality justify such deviation. All the rest is found in DIY shops. There are also some materials already available at the workshop: aluminum plate for triangles of the mirror cells, counterweight, nails, screws, etc… I have not counted the tools. 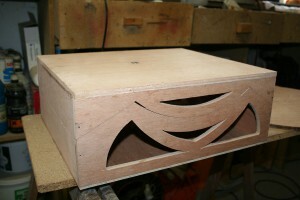 Conclusion : I have a dobson which meet very well the instruments from shops both in terms of cost and quality. In terms of portability, the is Strock the best. Pierre Strock : The Strock designer. Magnitude78 : Birth place of the Strock. Strock 250 : The pages that describe in detail the Strock 250 on Magnitude78 website. 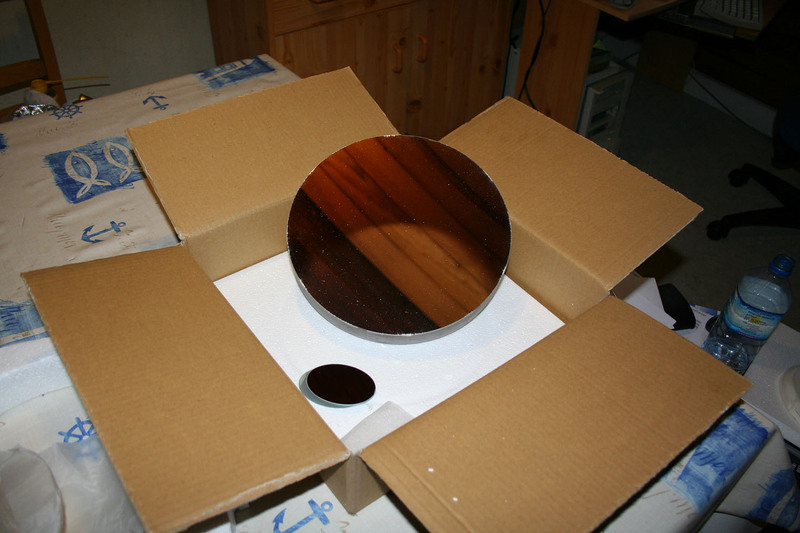 Thomas Jacquin photos album : A lot of photos detailing the construction of a Strock 250, the mirror making, the equatorial plate.